University of Portland students gather before heading out in work teams to improve Pier Park. Many hands make light work, or so the saying goes. On Saturday, March 19th, we saw that in action at Pier Park when 90 students came out to help remove invasive plants and graffiti, improve walkways and paths, and pickup litter and fallen tree limbs. In just a few morning hours the many hands of the University of Portland students made Pier Park more beautiful, accessible, and safer for everyone who comes here. Thank you! Warm from the oven cake donuts from Tulip Pastry Shop and hot coffee from Starbucks just before the arrival of students. 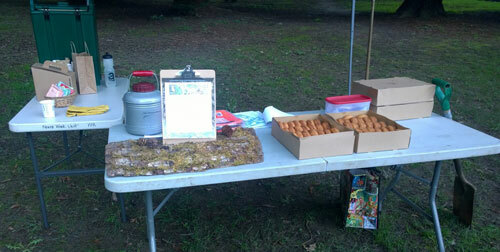 This event was coordinated between Friends of Pier Park, the University, and Portland Parks manager Alex Salazar. Salazar arranged for gravel to be dumped in advance ready to spread on the trails and a truck to remove piles of ivy, blackberries, and tree limbs as they were gathered. Thank you to Parks staff who kept the truck moving all morning to keep up with the students’ work. FoPP board members Matt Kuntz and Kelly Pergande along with members Joanie Belden and Mary Ann Aschenbrenner helped direct and supply the various student teams. Tulip Pastry Shop provided 125 delicious and still-warm-from-the-oven cake donuts at a greatly reduced cost and Starbucks donated the coffee. Students who helped remove scratchy pinecones from the playground area and part of their “pinecone collection”. Walk through the park to see the improvements. 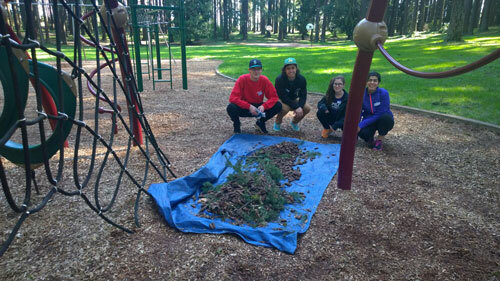 Even children on the playground will notice that pinecones were picked up from their play area because students raked through the playground mulch and removed pinecones that can be prickly and scratchy. Playground mulch at Pier Park is tumbled in such a way as to remove splinters. This makes it four-times more expensive. So, just removing and replacing all the mulch is cost prohibitive. The last group of students to leave were in good spirits. Thank you, University of Portland students. Your labor this weekend is very much appreciated.